The Wine Ponderer has already written about Wine Bottle Shapes And Sizes. But I wanted to address why the sizes of bottles matter. Have you ever walked into a restaurant or a wine store and seen the very large bottles of wine? What is up with that? How practical is opening a large bottle and drinking all of the wine? What if you don’t finish the bottle? Imagine putting the cork back in? I wouldn’t want that job. So I do my best to make sure if I am ever pouring from a large format bottle (yes, it does happen on a rare occasion) that there are enough people in the room to polish it off. So why are there large bottles? Does the wine really taste “better” when poured from a magnum? Well, let’s dig in a little deeper to see what the philosophy of wine is from large format bottles. – First, large bottles are great to look at. They definitely get your attention. And in a large room with a lot of people, you can’t miss these bottles. – Second, drinking from a large format bottle allows the wine to continue to change over time. Since it definitely takes a lot longer to finish a big bottle than a regular size one, the wine will continually evolve. So an argument can be made that the wine tastes “better” coming from a big format bottle. – Third, aside from the overly scientific fact previously mentioned, it is the undeniable joy and conviviality of a group of friends sharing the same experience from the same bottle of wine. – Fourth, it just looks cool pouring wine from a large bottle. Period. So just how big is big? A split is a quarter bottle at 187.5ML. Demi is a half bottle at 375ML. A regular wine bottle holds 750ML. A Magnum is twice that – 1.5L. 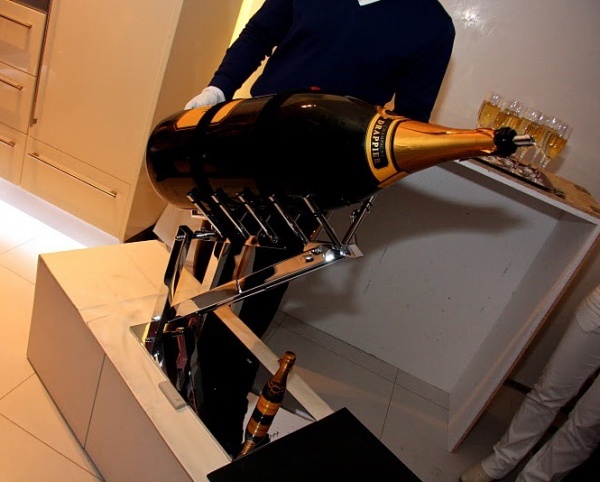 The Double Magnum, AKA Jeroboam, is 3L (4 bottles). Rehoboam is 4.5L (6 bottles). The Imperial, AKA Methuselah is 6L (8 bottles). The 9L bottle (12 bottles) is called Salmanazar. The 12L (16 bottles) is Balthazar and the 15L is called Nebuchadnezzar. And just when you think that 15L is a lot – after all, it is equal to 20 bottles of wine… The biggest bottle of champagne was presented in September 2012 from Champagne Drappier at 30 LITERS (40 bottles)! That’s a lot of wine flutes!! And check out the contraption that was used to pour this bad boy. They call this the Melchizedek. Now, I am guessing some of you reading this are ready to order one of these for your next big party. So I have done the research already and will share with you where you can get one. Go to Finest Wine and type in Drappier Champagne into the search. And you can order one for a great price of $6,568.15. I am not sure if there is free shipping with that. And since we are talking about bottles, why is there a “lift”, or more commonly known as a “dimple”, at the base of a wine bottle? The more technically correct term is “punt”. There are no certified explanations for this, but here are a few points of info that seem to make some sense. • It is possible that when bottles were blown glass using a blowpipe, there was another tool called the pontil that would leave a “punt mark”. By indenting the point where the pontil was connected, this scar would not scratch the surface it was sitting on or make the bottle uneven. • A bottle with a flat bottom has to be perfect – otherwise any imperfection would make it unstable. This lift would allow for some imperfections without sacrificing the stability of the bottle. • Wine sediment settles at the bottom of the bottle and this dimple would help prevent much of it from being poured into the glass. • This lift in the bottom of the bottle helps gain stability in holding the bottle by placing your thumb in the area, making it easier to pour. • Regular wine bottles hold 750ML. This dimple makes it look like there is more in the bottle than there really is. I must tell you after all this; I never actually measured the size of a punt in a Balthazar or a Nebuchadnezzar. So I would be curious to see just how much space that is. Can you guess how many wine bottle types there are? Find out in this related article about bottle shapes and sizes. I’m a big fan of big bottles for large groups. I bought a Balthazar of champagne at a charity event. It took two of us to pour it out. Balthazar is a big fellow! Who said size doesn’t matter? 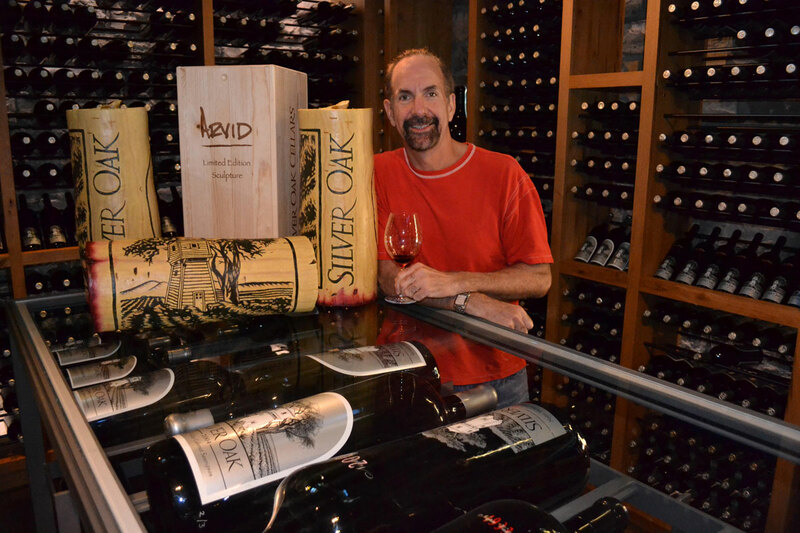 Looking for large format Silver Oak bottle for wine cellar… Can you direct me please? Depending on where you are located, I would simply recommend your local wine merchant. If you don’t have one near by, there’s always the internet. I buy a lot of my wine at K&L Wines in Hollywood. You can also order online. They do carry the magnum size (1.5L) for some of the Silver Oak wines. You can also buy direct from the winery – http://www.silveroak.com/shop/detail/2355/. Where can I purchase an Imperial size bottle? I have been looking online and can’t seem to find one. They have 6000 ml bottles for sale. And several 3000 ml bottles as well. What is the most economical Nebuchadnezzar wine bottle that you carry. Thank you. For a bottle of that size, I would recommend going to your favorite winery and ask them if they sell such sizes. What is height and width of a salamanzer and methusulah bottle? Just in case you were wondering about the other bottles as well, I have included them here. The dimensions of a Jeroboam average about 19.5 inches tall and 5 inches wide. Rehoboam has the same dimensions of a Jeroboam and is primarily used for Champagne. A Salamanzar bottle is just over 2 feet tall. A Balthazar bottle is about 28 inches tall. A Nebuchadnezzar averages 31 inches tall. I must tell you that trying to find the width of these bottles is difficult. I say buy some of these big boys and measure them yourself… Then post the results here so we can all learn something new… and be sure to invite us over when you open one of the bottles. I have a bottle of Toscano Castello red wine. It holds 3 liters of wine, stands 44 inches high with a long neck, year 1986. Is it worth keeping? In the event that you’re not able to get the information you need, simply gather the family and a few of your closest friends around, and open that bottle. Make it an event that people will enjoy and remember. My golden rule : Wine is only as good as the people with whom it is being shared. Hi looking for a Vcanter to hold / pour a Balthazar of champagne, any ideas where I can buy one? Many thanks. First of all, I will tell you this information only if you invite The Wine Ponder and me to your party when you open the big bottle up! Actually, Vcanter doesn’t make it easy to buy their products. I did look on their website and the US contact number is 516 441 0035. I would give them a call and see where you may be able to buy one of these contraptions. Be sure to send us a picture of it set up with the bottle on it! Where can I find and purchase an empty bottle, such as the ones you mentioned above? Methuselah, Salamanzar, Bathazar or Nebuchadnezzar. The only place I see empty large format bottles for sale are on eBay. Good luck. I was wondering if you can help, we have just been told we have a Balthazarbottle of champagne to open tomorrow at a wedding and serve. Is there a special way / technique to open them, we can serve with 2 people… Many thanks! Believe it or not, I suggest opening the large format bottle the same as you would the regular bottle. Carefully and slowly… Only have the second server hold the big bottle steady. There are a few videos on this from actual parties and events on YouTube. And the most effective way – unless the servers are equipped with a saber – is to get the cork out and pour the Champagne into appropriate glasses. You can look at this video if it helps – https://www.youtube.com/watch?v=zFukcz-CwBM. Be sure to send us a picture of the big bottle before and after it is opened! Can you direct me to someone that sells empty, with cork inserted black glass bottles so we can print onto the bottle ourselves. Thanks. Finding BLACK WINE BOTTLES can be a challenge. But this company appears to sell them. You may need to insert the corks yourself.